Alaska is huge. Traveling to even one of the state’s national wonders is a long trip. 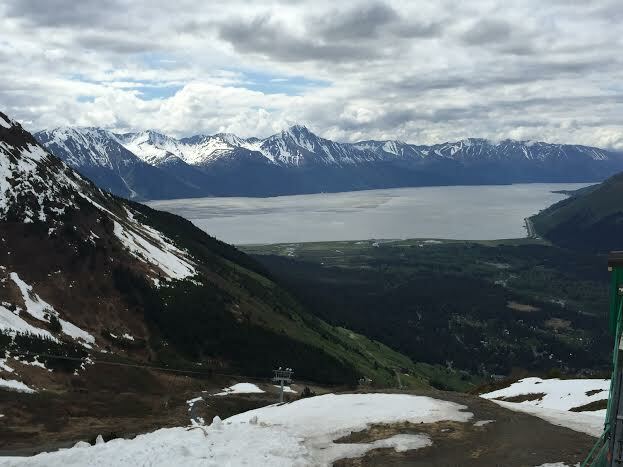 However, in my first visit to the state, I was fortunate to spend a week in the Kenai Mountains-Turnagain Arm National Heritage Area (KMTA) touring the area’s accessible scenery and enjoying the welcoming communities each one with its own fascinating story. The region offers a remarkable sampler of what the state has to offer. With the help of the KMTA, which provides maps and things not to be missed, I planned a route through the Kenai Peninsula. To a flatlander from the lower forty-eight, the heritage area exceeded my expectations. Within half an hour of landing at the Ted Stevens Airport in Anchorage, driving along highway that edges the Turnagain Arm inlet, the scenery takes your breath away. The inlet made famous by Captain Cook is on one side and is flanked on both sides by mountains reaching up thousands feet from sea level. On the particular weekend in May, when I started my journey, every wide spot on the highway was parked solid. It was the Hooligan run. Fisherman and families were on the shore or waist deep in what looked like pretty frigid waters dip netting for Hooligan, a seasonal treat. Learn more about the Hooligan run from a local subsistence fisherman. This was just the beginning of my journey. Many landscapes have deeply layered history and Kenai Mountains -Turnagain Arm National Heritage tells the story of a rich heritage: the native people, the Chugach, fished, hunted and traveled along its shores, early explorers, Russian traders, gold seekers and adventurous travelers including John Muir came to marvel at the region’s natural wonders. Yet some most gripping stories on the landscape are quite recent events. On Good Friday, 1964 a magnitude 9.2 earthquake dropped the coastal edges along Turnagain Arm by 8 to 10 feet changing the contour of the landscape and flooding the old gold mining town of Girdwood. Today Girdwood has been relocated two and a half miles up the valley at the foot of Mount Alyeska. The community has reinvented itself as a ski resort and tourist destination with a year round tram rides. 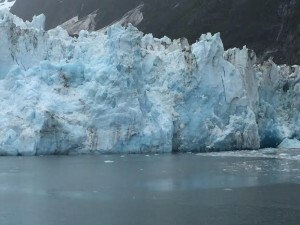 Harriman Glacier in Prince William Sound. Whittier is another community in the KMTA with an amazing back-story. The little port town on the blue-green Prince William Sound can only be reached by the one way Anton Anderson Tunnel that opens once every hour for cars heading through the 2.5 mile tunnel into town and on the half hour for cars going the other way. Cars also have to give way to train traffic as the tunnel is only as wide as a set of raised tracks. So just getting there is part of the experience. Whittier was built as a military base during World War II to provide access to an ice free port, later served this purpose as an outpost during the tensions of the Cold War. Today most of the town’s inhabitants live in one apartment block, the 1953 constructed Begich Towers. Historical signs guide visitors to other landmarks building from its military heyday. Today it serves as a fishing port and embarkation point for many of the cruise ships that ply the Alaskan coast. All these sites and stories were part of my experiences in the first two-days of my tour of the heritage area. My adventures continued by boat on Prince William Sound to the famous blue tinted tidewater glaciers that calved with a rush that rocked our boat and sent the crushed ice in waves around the bow. Boarding one of Alaska Railways famous trains, it wended its way through mountains and tunnels and past glaciers and waterfalls. Passengers called out as they spotted bear and moose and other wildlife. 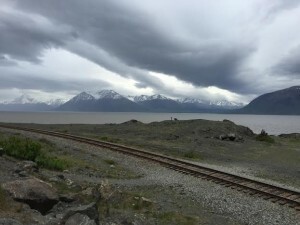 And then spent time touring the town of Seward the original starting point of the Itarod Trail and entry way to Resolution Sound and Kenai Fiord National Park. 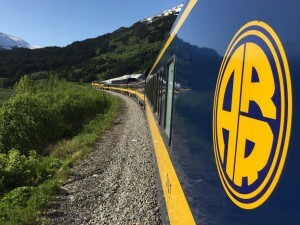 The trip culminated with a drive back toward Anchorage on the 127 mile Seward Highway with impossibly scenic views of the Chugach Mountains in every direction. The KMTA recently dedicated a sign on the Seward Highway that is a symbol to the partnerships that brings together the Chugach National Forest, the Kenai Fiord National Park and many local communities and organizations. This is just one of the community projects sponsored by the KMTA, which includes curriculum guides, maps and tours and on the ground community improvements. To read more about the history of the region, I strongly recommend Trails Across Time: History of an Alaskan Mountain Corridor by Kaylene Johnson published in 2005 by the Kenai Mountains-Turnagain Arm Corridor Communities Association. But don’t just read the book, plan your visit.